Please welcome author friend Jolina Petersheim to my blog! Almost three years ago when I first joined Twitter, Jolina was one of the first bloggers who reached out to me—I was so honored that someone with a blog I respected and loved so much was interested in following me. Thank you for that Jolina, and thank you so much for taking the time to appear on my blog, especially during this busy time . . . with a debut novel and a new baby—fun and exciting but a lot to do, I’m sure! GIVEAWAY! Jolina has generously offered to give one lucky commenter a copy of her book! To enter, just leave a comment before midnight EST on Saturday (July 20)! Aw, Julia, what a pleasure to be here with you today, and to remember how our friendship started with just 140 characters! Whoever said true relationships cannot be built through social media have not met people like you! I will never forget how you mailed a copy of Blueberries for Sal and some precious baby moccasins when I was about to give birth to our baby girl! I hope your little girl loves Blueberries for Sal, one of my favorites! I absolutely loved The Outcast. It’s my favorite book of the year. One of the many things I loved about the book was the complexity of the story. Each character and every thread of the story was intricately layered and woven together in deep and meaningful ways. I’m curious if the whole story came to you at once or did it develop as you wrote it? Did you plan it, outline it, and are you a “pantser” or plotter by nature? I am a mixture of pantser and plotter! (So, I guess that would make me a panter?) 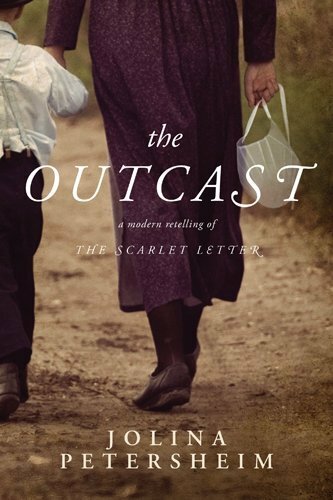 Before I began writing The Outcast, I knew that I wanted to retell The Scarlet Letter, but that a medical conundrum would force the illegitimate child’s father to choose between salvaging his pride and saving his son. However, other plot threads wove together on their own volition. Leah, for instance, was never supposed to be the “dark horse” of the story, but a weak-wristed woman who was the counter opposite of her fiery twin, Rachel. Instead, she rose from that sick bed like a phoenix from the ashes and became one of my favorite characters in the book. Follow on question: can you describe your writing process? I know you’re a new mother—how has this changed your writing habits or preferences? Where do you write? Before my daughter’s birth, I used to sit in my special chair and write for up to eight hours without stopping except to eat or walk around to get the blood flowing again. This was how I wrote The Outcast in six months. I was expecting our little girl at the time, so I knew that I had to write as fast as I could before welcoming her home! I signed a two-book contract with Tyndale House when she was twelve weeks old. It wasn’t always easy, for sure, but whenever she was sleeping, I would grab the baby monitor and write on the front porch. I am so grateful to say that I completed my second book, The Midwife, before my deadline. Though I haven’t started edits, it’s now been approved by Tyndale. I could not have written a book within my daughter’s first year of life without the support of my wonderful husband and family! I must tell you that Nathaniel Hawthorne is just about my all-time favorite writer. Aside from The Scarlet Letter, was there a real life story that was a seed for this book? Is there a “story behind the story”? Indeed, Julia, there is. Four years ago, a family member told a true story about the power of desire that was left unchecked and how it trickled down through an Old Order Mennonite family, not only affecting that generation, but the generations to come. We were all sitting around the kitchen, and after the person finished speaking, I gasped, “That’s a book!” But I did nothing about it. At the time, I was writing Southern fiction and did not want to surrender to “Amish fiction”—a genre my father always told me I should write. I was very impressed by your medical scenes and descriptions—both the holistic and the conventional. What kind of research did you do during the writing process? And was any of it based on personal experience (I hope not with the really scary stuff!)? It rang so true. I love everything about the writing process except outlines. Each time I sit down and decide to write an outline, I get bored within five minutes, toss my notebook, and start working on the story instead. It’s the same way with research, but I believe that research is vastly important, so I slough through that with more enthusiasm. The medical aspect of The Outcast was drawn from some of my personal experience, watching my best friend go through a bone marrow transplant five years ago at Vanderbilt Medical Center in Nashville (though Eli in The Outcast receives his in the children’s hospital). My best friend’s transplant took place the summer before I married, and I remember stuffing wedding invitations beside her hospital bed and feeling guilty because I was preparing to begin a whole new life while she was fighting for hers. Thankfully, though, my best friend’s transplant was successful. My hearts soars to share that I joyfully sobbed, watching as she married my English major chum last summer, and that she is officially in remission! What other types of research did you do for the book? I asked my mother questions, who then recalled interactions with my Old Order Mennonite great-grandmother Verna Grove. I read books about my Anabaptist heritage and genealogy, like The David and Anna Miller Story. Or I asked my mother-in-law questions, whose father was kicked out of the Amish church at seventeen. I am blessed to have an oral history around me. It sure beats Google any day! You’ve written of your own upbringing, that the Plain people are your people. This was the first book I’ve read about Plain communities, and I must say it was something I really loved. How did your childhood experiences make it easier or more difficult to write this story? Were there things that were hard for you to write about? Were you ever worried about how the story might be perceived by friends or relatives? I believe my childhood experiences made it easier to write The Outcast. Without having firsthand knowledge of the intricacies of an Old Order Mennonite community, I would not know that Gentle People are not a utopian society, but struggle with sin as much as the Englisch. I believe this is something that is overlooked in most “bonnet fiction” and one of the very reasons Tyndale House is launching The Outcast (their first Amish fiction in fifty years of publishing) and my agent, Wes Yoder (who represents mostly nonfiction), agreed to represent me. Thus far, I have received only support and love from my family and friends. Those who have been shunned from their communities have also reached out to share how The Outcast has touched—and, in one instance, even healed—their lives. I am so very grateful. As a writer, I generally have a vision in my mind of who a character “is” and what he or she looks like—sometimes I take photos of people and/or cut out pictures from magazines or print them from the internet. I wonder if you had “models” in mind for each character? Or, if you were to name an actor or actress to play their parts, who they might be? Another book reviewer, Book-alicious Mama, recently asked me the same thing! It actually inspired some pins to my Pinterest board. But if anyone has any more suggestions, I’d love to hear those as well! WARNING: POTENTIAL SPOILER ALERT! I really like that Rachel and Leah are twins and that Tobias and Judah are brothers with such a wide age difference. I also very much like the names you chose. Can you talk a bit about how you chose the names, the significance, if any? And also, why did you choose to have Rachel and Leah be twins and have such a wide age range between Tobias and Judah? Thank you! I enjoyed the biblical allusions and sense of competition, however subtle, that was immediately created by naming my main characters Rachel and Leah. Tobias King sounded harsh on the tongue, whereas Judah was softer—reflecting their different natures. Amos King, their deceased father, was actually named in memory of my husband’s grandfather, Amos Stoltzfus, who was kicked out of the Amish church when he was seventeen years old. Initially, Rachel and Leah needed to be twins for the medical twist in the plot structure. However, the deeper I got into the story, the more I understood the significance of Rachel and Leah being twins and how they both reflected and countered each other’s strengths throughout their lives. My brothers are fifteen years apart (I’m in between them), and I’ve always been intrigued by that age gap and how it can make a sibling more like a father figure than a brother. This was important for how Tobias looks down on Judah, mollycoddles him in a way. It isn’t until Judah breaks away from the community and from his brother that he is able to find out who he truly is. Don’t forget to leave a comment to enter the drawing for Jolina’s wonderful book! 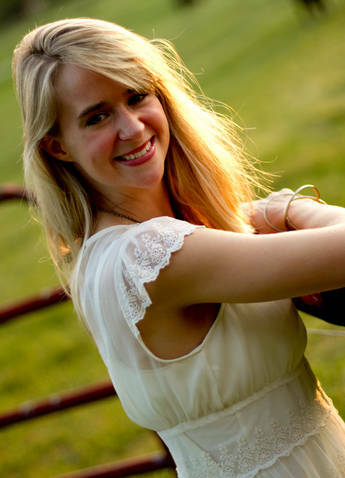 Jolina Petersheim holds degrees in English and communication Arts from the University of the Cumberlands. Though The Outcast is her first novel, her writing has been featured in venues as varied as radio programs, nonfiction books, and numerous online and print publications. Her website is syndicated with The Tennessean’s “On Nashville” blog roll, as well as featured on other creative writing sites. Jolina and her husband share the same unique Amish and Mennonite heritage that originated in Lancaster County, Pennsylvania, but now live in the mountains of Tennessee with their young daughter.